Rainy days and car trips are an unavoidable part of summer. So beat boredom with these engaging toys for tots to tweens. 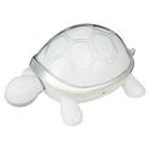 Hasbro I-Turtle ($20, age 8+) It's a cute, little pet your child will enjoy taking care of. Though it’s supposed to be for ages 8 and up (mainly for girls), we think children of any age—or gender—will enjoy it. The younger ones can watch it dance to any music that it hears. Dancing entails raising its shell, swaying its head, tapping its foot and flashing the different colored LED lights on his shell. Older kids can plug it into a portable music device and use it as a portable speaker. 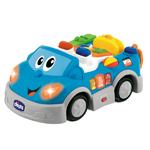 Chicco Talking Vacation Car ($50, age 18 months+) Did someone say vacation? Take this fun-packed car with you when you pack the family up this summer, and let it teach your tots a few new words on the way. This talking automobile teaches both English and Spanish, and has three levels of play to choose from—Word Mode, Story Mode and Riddle Mode. A suitcase-shaped picture book is included to help children follow along with the stories. 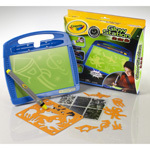 Crayola Glow Station on the Go ($15, age 6+ ) Think campsites, sleepovers or even a long car ride. That’s where Crayola’s new Glow Station on the Go is at its best. It's simply a lap-sized canvas for glow-in-the-dark drawing. Your kids can make their own freehand drawings with the included light wand, or use the stencils and texture sheets that come with the product to create something different. Once the kids are done, they can simply turn the lights on to erase it. It even includes a compartment in the back to store all the pieces. Fisher-Price Fun 2 Learn Color Flash Laptop ($30, age 3-8) In our homes, the computer is a favorite toy. So how do you keep a curious tot's hands off your expensive equipment? 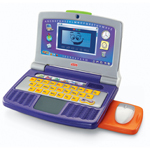 Try Fisher-Price’s newest laptop toy. With six learning modes, including letters, phonics, numbers, music, games and typing, it promises all kinds of fun and learning. The LCD display switches between red, green and blue backlit screens, and there is a slide-away mouse and rubber keyboard that can be banged on, tossed and manhandled. 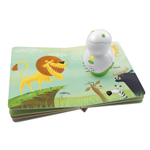 Leapfrog Tag Junior Pal ($35, age 2-4) Tag Junior Pal is a reading system that allows toddlers to follow a story with an interactive easy-to-grasp device made especially for tiny hands. Children use it to interact with specially printed board books. By pressing the base to the book, a child can have each page read aloud, hear sound effects embedded in the pictures and listen to music. The books are themed for preschoolers and toddlers with characters like Curious George and The Backyardigans. Books are $11 each. The Goldberger Co. Water Wonders ($10, from birth) If you’ve got a very little one at home, you simply must check out this line of water toys. 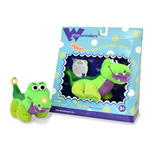 Water Wonders are soft, plush toys that light up and blink when they touch water. They are embedded with a chip that will eventually turn the lights off, so the batteries won’t run out too quickly. There are six characters to choose from, including Albert the Alligator, Fernando the Frog, Sinbad the Shark, Shelley the Turtle, Otto the Octopus and Felicia the Fish. 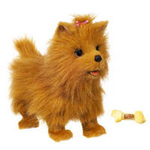 FurReal Friends Lil’ Patter Pup ($25, age 4+) If you’re tired of listening to your child’s pleas for a dog, you may want to try this new Furreal Friends Lil’ Patter Pup. It walks, barks, wags its tail and even sniffs an included bone. Soft, happy and oh-so-real, we have to admit, Patter Pup is almost freaky. Take it anywhere to keep your kids company, and don’t mind the eating noises. Best of all? There’s no cleaning up after this little guy. Make your selection from the Pomeranian and the Shih Tzu.